It’s not every day that eager student entrepreneurs get to sit down and talk with a representative of Her Majesty the Queen about the challenges of growing their fledgling businesses. But current and former University of Toronto students Dikshant Batra (Nova Sentio); Christina Cai (Knowtions); Ryan Doherty (iamsick.ca); Bin Liu (iMerciv); and Rhea Puri (SoCity) were more than up to the challenge. “What is most exciting? What are you optimistic about and what keeps you at it?” Ontario Lt.-Gov. 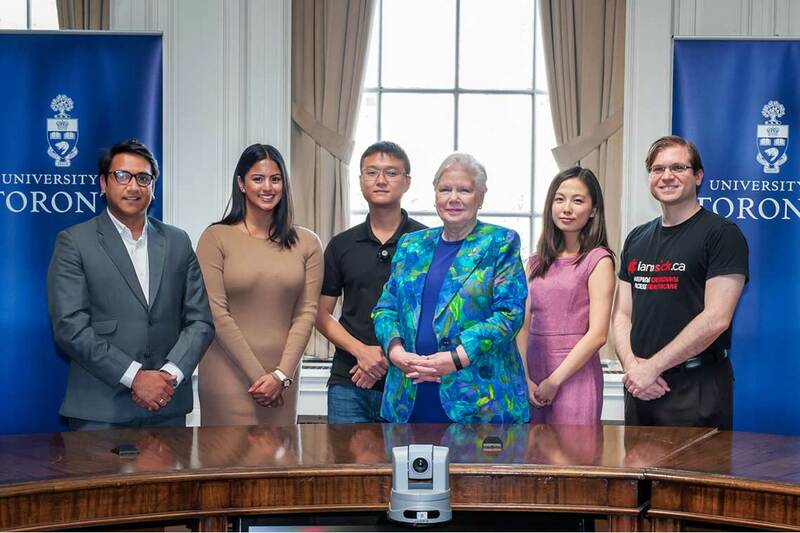 Elizabeth Dowdeswell, a former university lecturer and executive director of the United Nations Environment Programme, asked the students during their roundtable discussion. The event was part of her May 17 visit to the St. George campus, which was focused on innovation and how the university is a world leader in producing important research, attracting top talent and instilling and supporting an entrepreneurial spirit in its students and faculty. Cai, who has her BA in philosophy and economics from U of T, is enjoying growing success with her company that shortens translation times for complex science textbooks and journals using a combination of top minds around the world and machine learning algorithms. Meaning, don’t panic. Keep going. “What drives me is the same thing the scares me: it’s the uncertainty. It’s an adventure,” chimed in Liu, whose company has created Buzzclip to help people with visual impairments. The device, which looks like a button on your lapel, uses ultrasound to detect obstacles in the wearer’s path. Being an entrepreneur was never in the cards, Liu said, because he was meant to follow in his family’s footsteps and become a civil engineer. But fate intervened when he met Professor Cynthia Goh, the academic director of the Banting & Best Centre for Innovation & Entrepreneurship (BBCIE) at U of T.
Now, he and his business partner are close to finding a Canadian distribution centre for their product and organizations supporting the visually impaired in 20 countries have expressed support for Buzzclip. All five students credited U of T’s nine accelerators, such as the Impact Centre and I-CUBE, for helping them see the potential of their ideas and finding the right path to turn them into reality. In 2015 alone, these accelerators worked with more than 225 student-led startup teams and supported more than 80 new companies that attracted nearly $20 million in investment and generated $2.5 million in sales. “I’m very thankful for what U of T has provided,” said Puri, who is continuing to work on her website that pairs Torontonians with activities and restaurants that cater to their personal choices. Along with the roundtable, the lieutenant-governor also toured the Sidhu Lab in The Donnelly Centre, met Nobel Laureate and University Professor John Polanyi and helped present the U of T Invention of the Year Awards at the third annual U of T Celebrates Innovation event. “We live in one of the most privileged places in the world,” Dowdeswell told the crowd of about 200 people gathered for U of T Celebrates Innovation. And yet, she said, most Ontarians have no idea of the research and innovations that are happening in their province at world-leading institutions like U of T – research that’s helping find real solutions to the needs of society. Appointing herself as the province’s new “chief storyteller” the lieutenant-governor said the university needs to do a better job to “get these stories out to the average person on the street” so they know what we’re good at in Ontario and can be proud of what we are. “I’d be happy to be one of the tools to get that message across,” she offered.